The emerald ash borer and extreme weather events have destroyed approximately 13 million trees in the Chicago area. 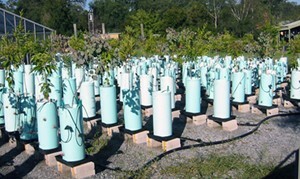 To help remedy that the Metropolitan Water Reclamation District of Greater Chicago (MWRD) staff began distributing more than 14,000 oak tree saplings. The distribution is part of Restore the Canopy, Plant a Tree in Cook County, Ill. Since the creation of its new free tree distribution program in spring 2016, MWRD has forged partnerships with 25 different municipalities, 30 schools, and 46 community groups. The trees reduce city heat island effects, absorb carbon gases, produce oxygen, improve the habitat for wildlife, and serve as an effective form of green infrastructure to reduce flooding. A large oak can reduce 20,400 L (5400 gal) of stormwater runoff. So, planting the 14,000 trees estimated equates to more than 284 million L (75 million gal) of stormwater storage.